Clear crystals and opal or light blue crystals create lovely snowflake pendants. It’s a design I created for my beadweaving class and my students loved it so much. I make jewellery – mostly rings – using various beadweaving techniques, combined with vintage crystals, buttons and other bits and pieces. When I first started beadweaving I was most inspired by the work of Laura McCabe. My rings are big and colourful and pretty unique. The spinner is a clever bit of beadweaving using ladder stitch. The middle bit is a crystal bezeled rivoli which slides through the spinner and the spinner can then be changed. The Carousel spinner is bare, but the ring spinner has the addition of sparkle with the 3 mm crystals on the face of each tip. Even if you don’t heavily embellished work, or that dripping in crystals, there’s no denying that used well crystals in all forms can bring a touch of light to any project. First up is what I have called “Crystal Interchangeables” or “Sparkly Crystal Wheels”. 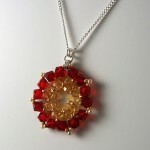 Swarovski crystals are renowned for their unmatched sparkle, quality design, and amazing colors. And even though they aren’t quite as versatile as bicones or rondelles, there are many fun and beautiful ways to use them – from metallic settings and bails, to beadweaving and even crochet. Now here’s the twist the keyword for this month’s challenge is Crystal so we’d like you to include crystals somewhere in your entry. Any technique is accepted, from beadweaving and stringing to wire work and bead embroidery. This video shows how to weave cute cat from Swarovski Crystal.